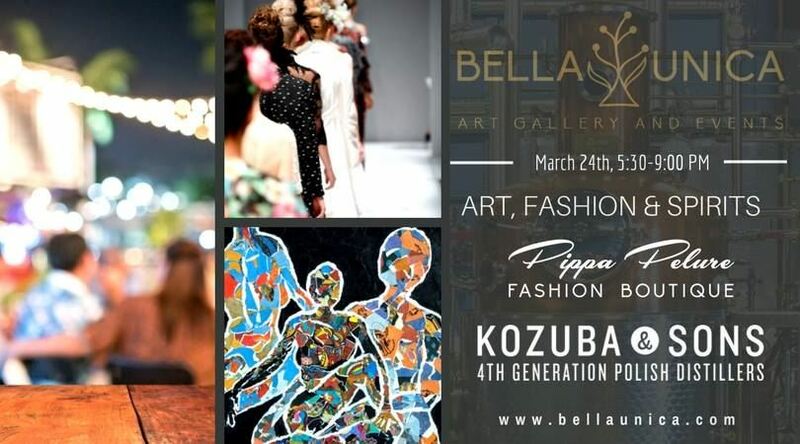 ART, FASHION & SPIRITS at Kozuba & Sons Distillery! Meet local artists and buy original art from the best talents in Tampa Bay. See the latest American and European fashions, while enjoying a distillery tour and samplings of the finest Polish Vodka available. Music, hors-d'oeuvres and a donation bar will make this Saturday night fun, fashionable and frolicking! Art Show. Bella Unica presents talented local and international artists. Rare opportunity to meet the artists and buy original work of art. Wilmar Pabon, Dee Perconti, Karen Porter. Our visitors also will have a unique chance to see famous Helmut Preiss original artwork. Fashion Show. Pippa Pelure is a unique boutique where women walk in with curiosity and expectations, and leave happy, confident and with a sense of accomplishment, ready to conquer the world. New Spring / Summer Collection from Joseph Ribcoff, Alberto Makali, Balenciaga, Desigual, Frank Lyman, Julian Chang and more!. Kozuba Private Distillery Tour. Founded in 2005 in Poland, Kozuba & Sons is a family-run distillery that produces premium craft spirits. Now at home in St. Petersburg, with over 11 years of experience, the Kozubas are focused on sharing their passion with the American market. The event is FREE and open to the public, however, we would gladly appreciate if you RSVP via natalie@bellaunica.com or our Facebook Event Page!